I eventually bought a Janisong, and this is a very interesting knife. Compared to a Benchmade 51, the Janisong is shorter, and noticeably heavier (5.4 ounces). In the open position, the notch at the end of the "bite" handle, i.e. the naked steel inner part, allows a lock of the knife once opened. And here is the knife in the unlocked position. 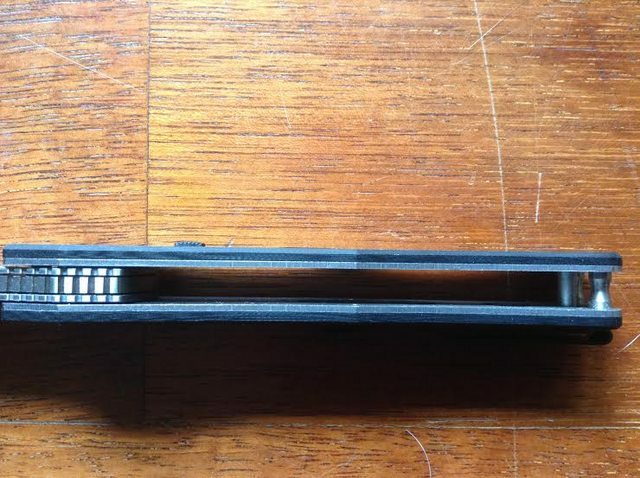 You can see that tolerances are quite tight and that there is room inside the safe handle (handle with G10) in order to have the "bite" handle is lodged inside it. And here in the locked position (notice the little tube at the right of end of the handle that is now engaged). 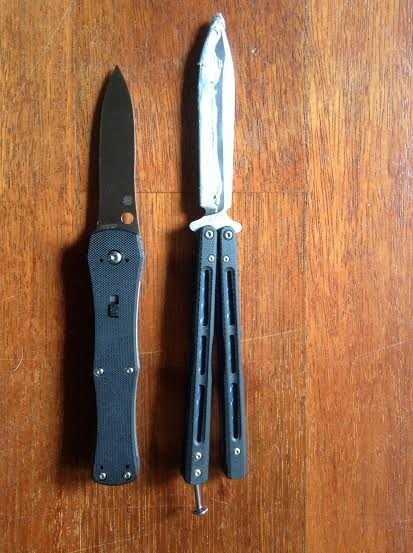 Apparently, lots of pure bali flippers are a bit reluctant to play with this knife, but my view is the following one (caveat : I am a beginner flipper). -the locking mechanism is really good : it allows one-handed locking the bali in the open position without having to fiddle with a second hand and a latch. -for those who have a more utilitarian use of this knife, this bali has G10 and has some gimping and once open, has a much better grip than a regular bali as it resembles a dagger more than a bali. It is way more comfy to hold than a bali. -the blade is single edged, but looks like a dagger, and it is quite unususal to see that in a bali. 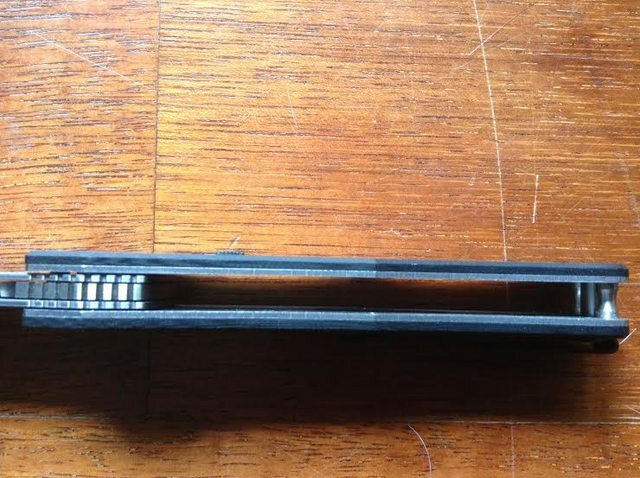 -the safe handle is really safe : as the bite handle is inside the safe handle, and the blade is inside the bite handle, it is extremely difficult to get cut as you have two lawyers of protection before you reach the blade. -this is really innovative and clever, and it is good to see such products arrive on the market. -the locking button looks a bit fragile (it is a piece of G10, and I would have preferred to have a piece of steel instead, like the locking button for Benchmade autos), and I really wonder if it will stand the test of time. 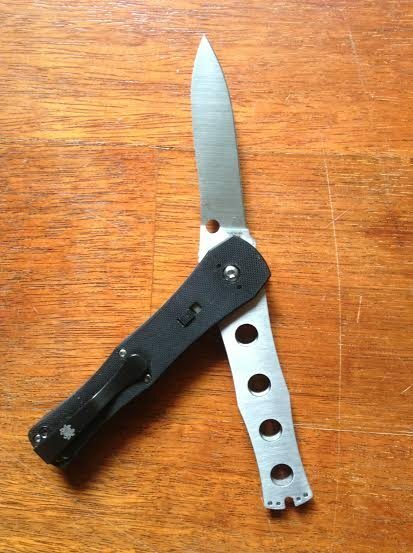 -the Spyderco hole is very gimmicky and does not seem to add any value. It is certainly one of Spyderco’s odd ducks. I’d bet on hugely collectable in a few years. Took an arm and a leg (or a FlyFather trade to a guy in Europe) to get one, but it's very unique and cool. Definitely not a flipper or for fun. More of a tool than a toy. It'll be worth a good bit when production and stock dry up.